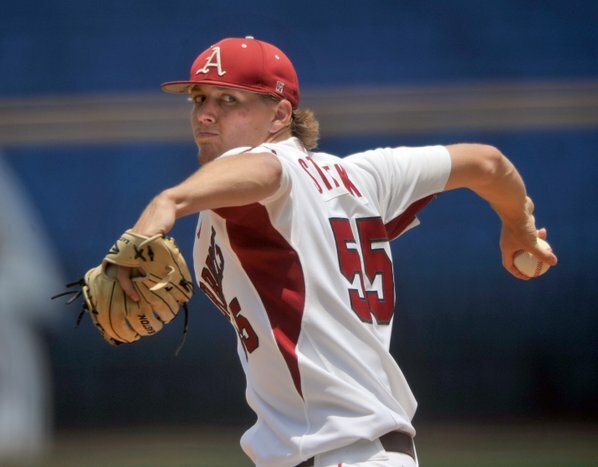 Ryne Stanek has a 1.39 ERA in sixteen starts for the University of Arkansas. D.J. Peterson, a third baseman for the University of New Mexico, could very well end up being the most successful hitter to come out of the 2013 draft. Currently third in the nation with a .310 batting average, Peterson also knows how to draw a walk to get on base. He also ranks third in the nation with a whopping 18 homers in 2013. Sure, he is almost definitely a first baseman, but D.J. Peterson is a very solid bet to hit well enough to play one of the most offensive-demanding positions in the game. Peterson would be a good choice for the Mariners because he could potentially bring a lot of power to a weak lineup, he shouldn’t be too expensive to sign, and he could end up being the best hitter to come from this draft. J.P. Crawford, a top shortstop from Lakewood HS in California, will likely be a top 15 pick, unless he decides to make it known that he will not forego his commitment to the University of Southern California. Crawford, who is the nephew of Carl Crawford, is an outstanding athlete who is extremely toolsy. Batting from the left side of the plate, Crawford has the ability to hit for average and he could potentially add some power down the lineup. The Mariners should consider picking J.P. Crawford because he will be able to stick at shortstop, he is one of the most talented athletes in the draft, and he would have the ability to become the face of the Mariners franchise if he reaches his potential. -Hunter Renfroe, an outfielder from Mississippi State University, was drafted in the 31st round of the 2010 draft as a catcher but has since switched to corner outfield at MSU. Renfroe has big-time power. Even though it hasn’t always shown up in games in the past, he does have fifteen homers this year. 2013 has kind of been the year he has put everything together. With possibly a 65-70 grade arm in the outfield, Renfroe should be able to be slightly above-average in terms of defense. The Mariners should pick Renfroe because of his massive power and because he will be a quick riser through the Minors. 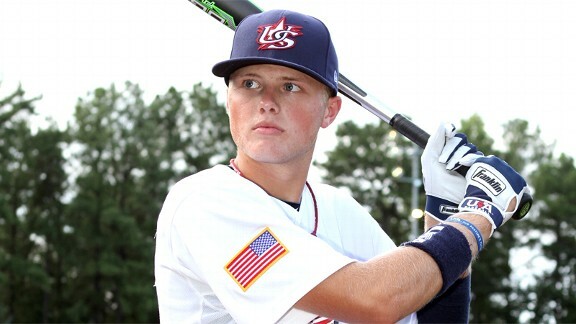 -Austin Meadows, an outfielder from Grayson HS in Georgia, is 6’3’’ 200 lbs. with room to grow, but he has the fast twitch muscles to play center field down the line. Meadows has some problems with his swing that will need to be fixed, but if all goes well he could be a 25-30 HR a year guy down the road. Generally considered the top prep prospect in the draft, there is a fairly good chance that Meadows will not be available when the Mariners pick with the twelfth overall pick. However, if he is still on the board, the Mariners should select Austin Meadows because he could turn into an All-Star center fielder with above-average power. Stanek has become one of the top pitchers at the collegiate level due to his nasty curveball/slider combo paired with decent velocity. While he does have a lot of work to do, mostly regarding commanding his fastball and a couple of mechanical issues, Stanek has been at times considered the best pitcher in this draft. The Mariners should select Ryne Stanek with their #12 pick because he has the potential to be a #2 starter and he could rise quickly through the Minors if he makes a few improvements. Austin Meadows hit .535. with 4 HR and 17 stolen bases for Grayson High School in Georgia. Posted on June 2, 2013, in MLB Teams: Articles and Analysis, The Rest: Everything Baseball and tagged @MLBreports on twitter, @RJA206 on twitter, arkansas baseball, austin meadows, baseball, dj peterson, hunter renfroe, jp crawford, mariners, mariners baseball, mariners draft 2013, mlb, mlb draft 2013, ryne stanek, seattle mariners. Bookmark the permalink. Leave a comment.